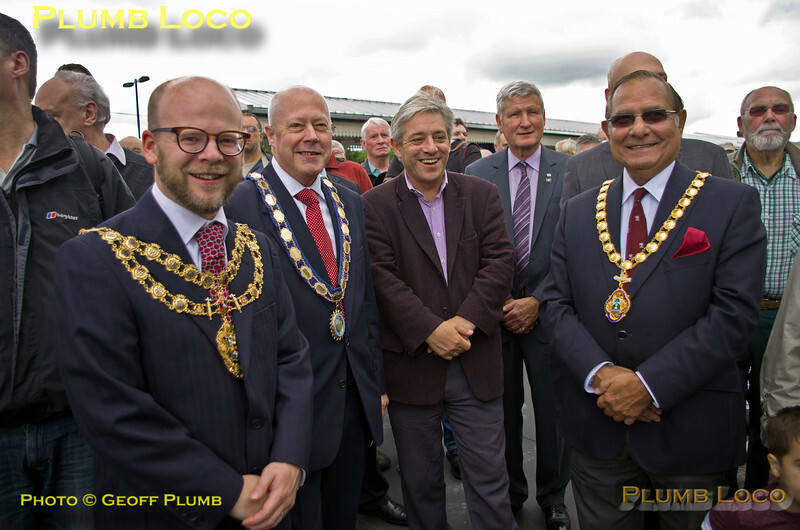 Diverse dignitaries at Princes Risborough station prior to the official opening of the temporary Platform 4 in connection with the Chinnor & Princes Risborough Railway celebrations for "Haversham & Friends". From the left: Councillor Tom Hunter-Watts, Mayor of Aylesbury, Councillor Alan Turner, Mayor of Princes Risborough, the Rt Hon John Bercow MP, Speaker of the House of Commons and local MP and Ian McEnnis, Chairman of Wycombe District Council. 11:09, Saturday 5th October 2013. Digital Image No. IGMP1178.